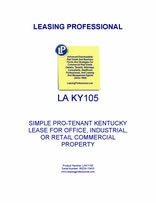 This form is for a single tenant Kentucky lease where the tenant has superior leverage. It gives the tenant the right to use the premises for "any legal use," and has very abbreviated remedies for the landlord in the event of a tenant default. It is also pro-tenant in character because of the clauses it does not contain which customarily appear in pro-landlord forms relating to remedies and a variety of other pro-landlord provisions. Kentucky is considered to be a Southern state, although it is located quite centrally in the Midwest. Incredibly, despite being landlocked, Kentucky has a very large amount of shoreline, thanks to its many lakes and rivers. Kentucky produces tobacco, corn, peanuts and wheat. The state is also somewhat famous for its whisky: known as Bourbon, Jim Beam Maker’s Mark are two of Kentucky’s better-known brands.